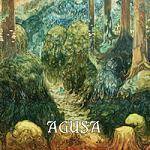 More information: Swedish psychedelic/progressive rock alchemists AGUSA present their third full-length album, simply titled Agusa. AGUSA‘s output invokes visions of nature and the cosmos, their ethereal passages meandering into realms of a possibly supernatural or parallel existence. While not an entirely instrumental act, backing vocal mantras only seep in through purposeful cracks in the construction of these immense hymns, adding an even more expansive sentiment to the proceedings.